Looking for a nice, recliner chair to accent your home? Do you want something that you can plop into after a long day or anything that will make a movie marathon or a gaming session more entertaining and comfortable? If you want to check out whether the BONZY Contemporary Theater Seating Recliner Chair can fetch you these, then this article has got you covered. A good recliner chair is in no way a capricious piece of furniture to own. Getting a good one is an investment for your health and well-being as it affords you a nice place to rest and relax right in the comfort of your home. It lets you unwind and get lost in your thoughts, or drift to sleep as you nestle in its cushy embrace. The back cushioning is quite comfortable, very ideal for movie marathons and extended gaming sessions. It has a solid feel to it. It is easy to assemble. It only takes one tool and two steps to attach the backrest and back ears to the main body. They are also easy to remove for moving. It offers a roomy space for you to sit back and enjoy a movie. The two built-in cup holders lend a superb theater feel to your viewing experience. Place popcorn on one slot and your favorite drink on the other slot. The frame is made from strong and durable Laminated veneer lumber or LVL which is stronger than natural wood. The latch and control cable is conveniently positioned at the side. The armrests are hard. It would have been great if they were thick-padded as well just like the back cushion. When fully reclined, you may need an extra pillow to be able to watch a movie comfortably. The BONZY Contemporary Theater Seating Recliner Chair is a dream. It features a modern design with a classic feel to it. And coming in two color variants, this lounge chair is sure to blend well in a contemporary home. It brings the movie theater experience to your home with its two cup holders, and it adds a touch of homey luxury through its thick cushioning on the back and head support. And with its roomy size, you get a comfortable nook for recreation or relaxation. Its hand lever is positioned on the side so that you can conveniently lift the leg rest and the backrest. The chair reclines from 110 to 145 degrees for sitting and lying down. Had the armrests been as warm and cozy as the rest of the recliner, this lounge chair would have been perfect. As it is, it is not hard to imagine falling asleep on it while watching a movie. 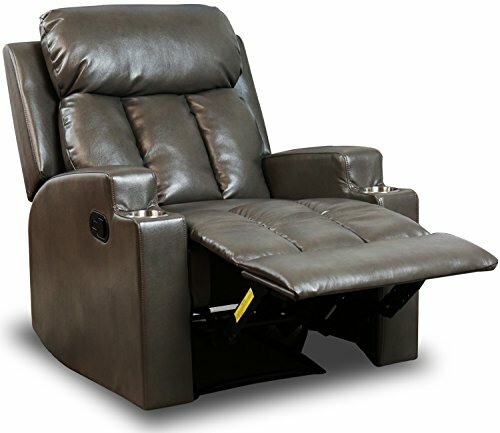 The BONZY Contemporary Theater Seating Recliner Chair is competitively priced. While there are indeed cheaper options out there, this recliner chair offers good value for your money, considering the comfort it provides and the materials it’s made of. If you like most of the features of the product in review but a bit wanting, then the Windaze Massage Recliner is something worth considering. Like the BONZY Contemporary Theater Seating Recliner Chair, it offers a luxurious home theatre experience. It’s roomy and fitted with two cup holders. The back cushioning is even more than what you get from the product in review. But unlike it, this one comes with a more comfortable armrest that’s thick and soft. The chair also reclines to a comfortable sitting and lying down position with the help of a hand lever conveniently positioned on the side. Besides the softer armrest, there are more serious reasons to like the Windaze Massage Recliner. Top on the list is that it’s not only a recliner but also a massage chair. It’s fitted with eight vibrating massage motors to ease tired muscles. That’s getting extra loving from an already comfortable recliner chair. If you don’t need a massage but just want to get lost in a warm, cushy chair, then this recliner has also got you covered. It’s also equipped with a heating system with wireless control. Additional features that you may also love about it that’s lacking in the BONZY model are the 360-degree swivel and the pocket on the side. The 360-degree swivel, in particular, is a nifty feature. It allows you to at least turn the hefty chair with ease without having to get up and exert much effort. Admittedly, this is a feature not lacking only in the product in review but also with most bulky and heavy recliner chairs. While the comparison may sound unfair since this is a massage recliner chair, it isn’t. As a recliner chair in itself, the BONZY model already is almost perfect for its price range. The comparison is for people who like their stuff to come with bells and whistles. So, if you’re looking for extra cushioning on the armrest and you think the heating and massage functions are great features that you can use, then this is a good option. But of course, the extra features of the Windaze Massage Recliner come at a few more dollars. The BONZY Contemporary Theater Seating Recliner Chair is a wonderful integration of the movie theater experience and the coziness of a good old recliner chair. Its design makes it an easy fit to a contemporary home. And as far as comfort is concerned, it’s difficult to imagine how you’d prefer the movie house after you’d try this or how you could not be lulled to sleep in its ultra-comfortable head and back cushioning.